AIIMS PG 2019 Results declared on aiimsexams.org and List of candidates shortlisted for counselling. AIIMS PG Resutsl 2019: Entrance exam results announced, check the list of qualified candidates. The All India Institute of Medical Sciences (AIIMS) New Delhi has declared the results of post graduate entrance exam for January 2019 session on its official website. Candidates who appeared for the exam on November 18, 2018, can visit www.aiimsexams.org to check the list of candidates who are shortlisted for counselling. 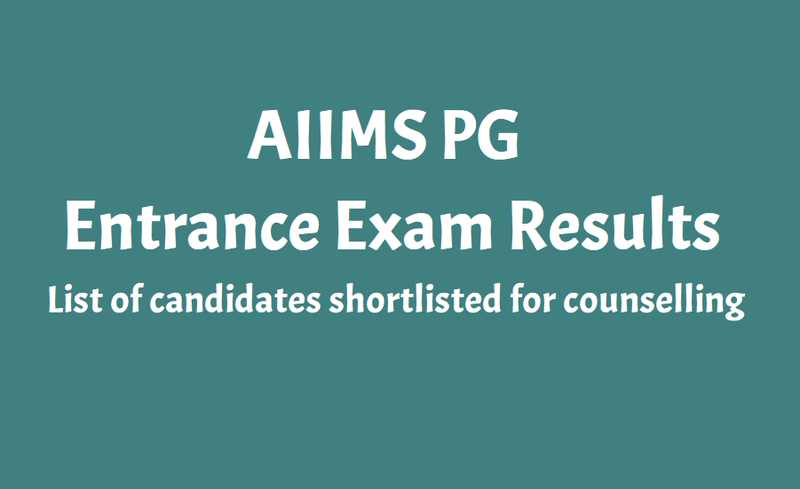 The list of candidates provisionally selected for the first round of counselling is now available on aiimsexams.org. Results are also provided below for checking. AIIMS PG 2019 was conducted on November 18, 2018 for admission to various MD courses at AIIMS New Delhi, Bhopal, Bhubaneswar, Jodhpur, Patna, Raipur & Rishikesh. Only the list of qualified candidates (till the 50th percentile) has not been released. Only the Merit List of candidates selected for counselling is released at present. The complete result would be available on aiimsexams.org after November 26, 2018. Also, the list released is in order of Merit and is 8 times the number of available seats in all AIIMS. To check the results,first go to aiimsexams.org and click on the activated link. The entrance examination was conducted by AIIMS for admission to various MD courses at AIIMS New Delhi, Bhubaneswar, Bhopal, Patna, Jodhpur, Raipur and Rishikesh. The exam was conducted from 9 am to 12 pm. AIIMS PG exam had one paper in English consisting of 200 objective type questions for MD/MS and 90 objective type questions for MDS. About AIIMS: The All India Institutes of Medical Sciences are a group of autonomous public medical colleges of higher education. These institutes have been declared by an Act of Parliament as Institutes of National Importance.